--where we put our focus is the direction we tend to go. Oooo instant fav! Love love love the colors! Love the colours in this and it suits the quote so well! 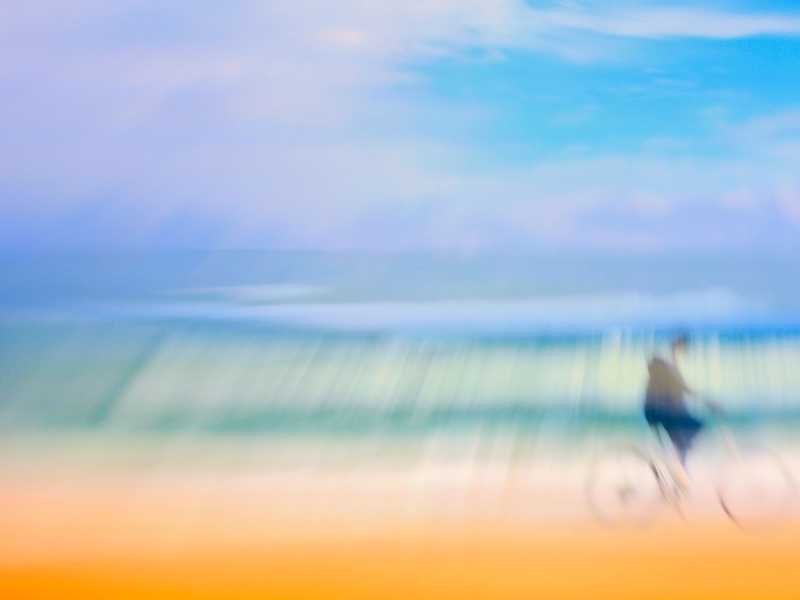 Very cool... love the colors and bicycle just barely there. This breaks all the rules, and I love it! @lucypics @luvmynynix @radiogirl @cutemagic @lynnz @kali66 @jackie8 @axika--THANK U all so much---really appreciate ur awesomeness !! Love the color and quote! love the words and the picture...so true. I am only just realizing this, I am a slow learner with some things! fav - so fab, Joey! Really love the dreamy feel to this one! fav! Love the thirds and how I would love that beach! "But it's all out of focus" ........ ;))) Fav! Can't stop watching this one! Fav! I love the impressionistic quality to this shot. Beautiful and dreamy. Lovely bright colours and composition. Lovely colours and ghostly cyclist. You are incredible at this type of shot!! Fav!! Cool movement and colours! Love the wheels. Great quote, colors, and message. Love the layers. Great quote. Neat composition and color! You always find the best quotes to go along with your fab pics! I'm dreaming of walking that beach right now - it's -34C with windchill tonight. Wow, the waves almost look like a waterfall. I love the colors of your world. So beautiful, always. And this quote really resonated with me. I'm working on keeping the thoughts all positive and loving all the time. It has led to amazing things. I love how you treat your images. Hugely inspiring to me, your processing choices. So many beautiful shots here. Love how you challenge all the rules but still end up with amazing photos! This is so gorgeous and painterly! So genius and so awesome! I LOVE this too - a fav. I dont know what you are doing but I really like it. Awesome shot!! Love the bright colors!! Just love the colours on this. Beautiful. Like the comp and colors! Wonderful colors and would be fabulous on canvas hanging on your wall. Love those words, I so believe in them, though still sometimes find it hard to keep 'focus', Lovely lovely shot. Your picture, title, and caption always goes together so well. I love this! Fav. Congrats. Just saw this on the PP. Well deserved. Great style to your shots.....very distinctive. I always look forward to see what you capture. This is wonderful! Love summer! Another fav. This is fantastic. No. 3 of TT - another double TT for you. Well done. I just love your style of photography! Dreamlike! Beautiful!